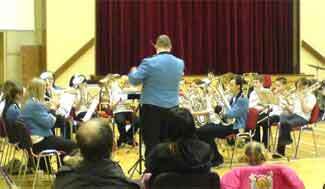 On Saturday 2nd February 2008 a selection of junior band musicians played a range of solos in a concert where they were accompanied by the senior band. 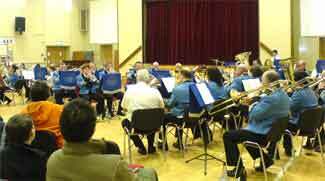 The concert was held in the War Memorial Hall and featured upwards of 70 musicians who performed to an enthusiastic audience of family, friends and guests, in particular, Mr Ivor Stevenson from Armagh old Boys Silver band whose commitment and tireless work for the brass band movement in Northern Ireland is unsurpassed. The band was also pleased that Euphonium player Ivor was willing to play along with the band as the whole ensemble played True and Trusty. Rebecca Donaldson, Nichola McCarroll, Libby Hawthorne and Rachel Donaldson will play The Irish Blessing. This will prove to be a great experience for all the performers and will also act as a warm up for a repeat performance this time with the accompaniment of the magnificent Fodens Band on Saturday 9th February 2008 in the Market Place Theatre, Armagh - an event that few people get the opportunity to experience. Once again your support is extremely important to these up and coming musicians. We look forward to your continued support at Armagh on Saturday 9th February 2008.